If you want to work incognito at the coffee shop, or blend discreetly into in the boardroom, Acer’s squarish, matte-black TravelMate Pro is the laptop to use. It doesn’t flip, fold, detach, or do any other fancy tricks. But staid is as staid does. The TravelMate Pro is light, rugged, secure, and fast. It has a vivid display with discrete AMD graphics, and it runs for nearly 6 hours on a single charge. It’s also cheaper than much of its business-oriented competition. 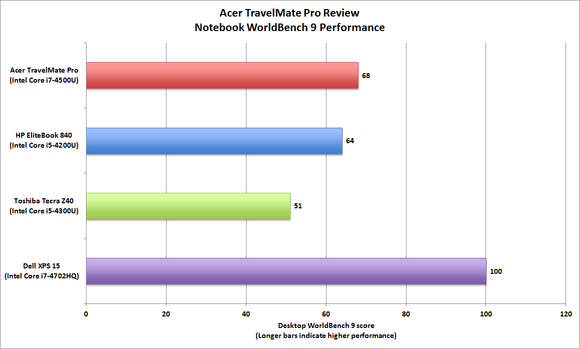 A fast computer lies beneath the Acer TravelMate Pro’s unassuming exterior. 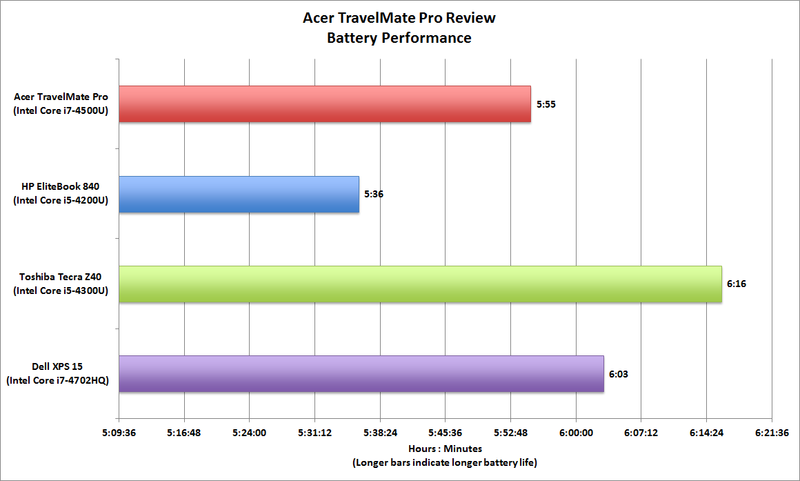 Acer sent us the TMP645-MG-9419 version of the Travelmate Pro, and that’s the last time I’ll mention the entire model name. Acer’s naming convention—and its website, with dozens of slightly different models—are needlessly confusing and need fixing. 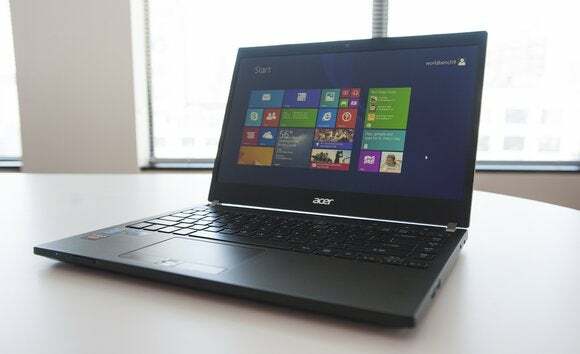 The Travelmate Pro Acer sent came outfitted with an Intel Core i7-4500u, 8GB of DDR3/1600 memory, a discrete AMD Radeon HD 8750M graphics processor, and a 256GB Toshiba SSD. The TravelMate Pro’s Core i7 processor, SSD, and discrete GPU helped it earn an excellent Notebook WorldBench 9 score of 68. As you can see from the chart, it’s just a bit faster than HP’s EliteBook 840 (the one we tested had an Intel Core i5-4200U and relies on integrated graphics), and it’s a lot faster than Toshiba’s Tecra Z40 (outfitted with an Intel Core i5-4300U and also reliant upon integrated graphics). And thanks to its discrete GPU, the TravelMate Pro even managed to deliver playable frame rates with games such as BioShock Infinite and Grid 2 (albeit at resolution of 1024 by 768 pixels). Still, that’s something no laptop with integrated graphics can accomplish. Video playing at the display’s native resolution of 1920 by 1080 pixels was butter-smooth, but movie soundtracks sounded—blah, for lack of a better word. Discrete GPUs are great for games, but they also help in the photo- and video-editing applications a small business might run. If the TravelMate’s appearance isn’t particularly compelling, its carbon-fiber chassis and all-metal hinges are. This laptop is very sturdy, though the bezel surrounding the 14-inch, IPS display flexes quite a bit. The TravelMate Pro earns its Ultrabook label. There’s at least one design oddity that will irk an IT department: The screws securing the access plate covering the hard drive and memory slots are of two different gauges. Not expecting this, I inadvertently stripped one of the smaller ones—a first for me, after opening hundreds of phones and laptops. This speaks of soft metal. And who wants to change screwdrivers twice every time they open an access panel? Certainly not anyone charged with managing a fleet of notebooks. If you want DisplayPort, you'll need to buy Acer’s $150 ProDock to get it. The TravelMate Pro’s input ergonomics are very sound. The touchpad is silky and the back-lit, island-style keyboard has full-sized keys with decent tactile feedback. You won’t mistake it for a Lenovo, but it’s not bad. 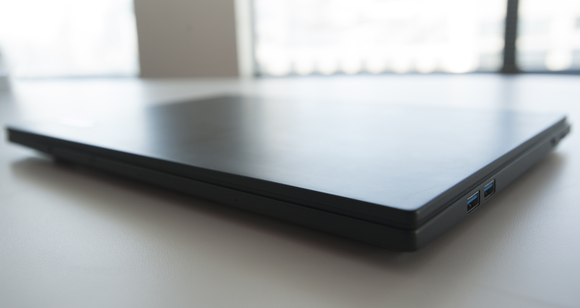 The notebook is also outfitted with a biometric fingerprint reader and a docking port on its underbelly. 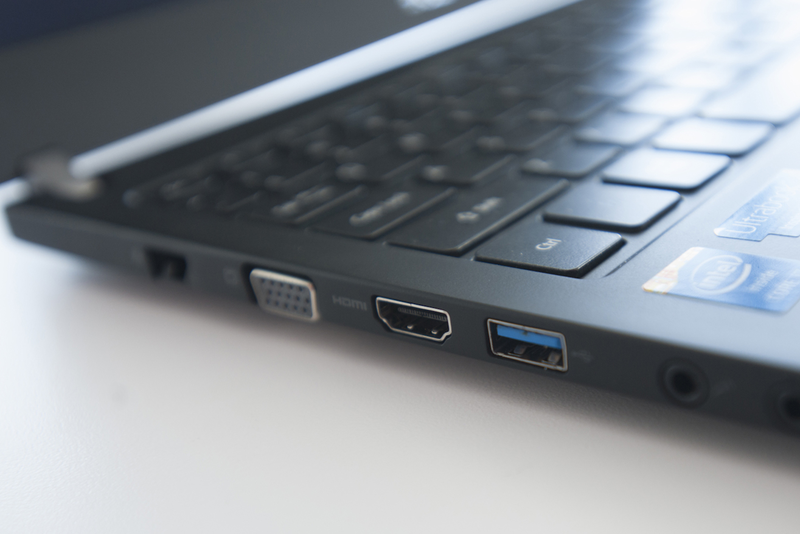 We expect to see VGA on a business laptop, but this HDMI port surpirsed us. 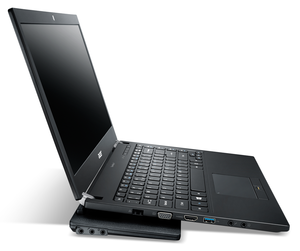 While the TravelMate Pro’s Core i7-4500u doesn’t include Intel’s vPro technology, the laptop does come with a Trusted Platform Module chip and ProShield software to leverage it. 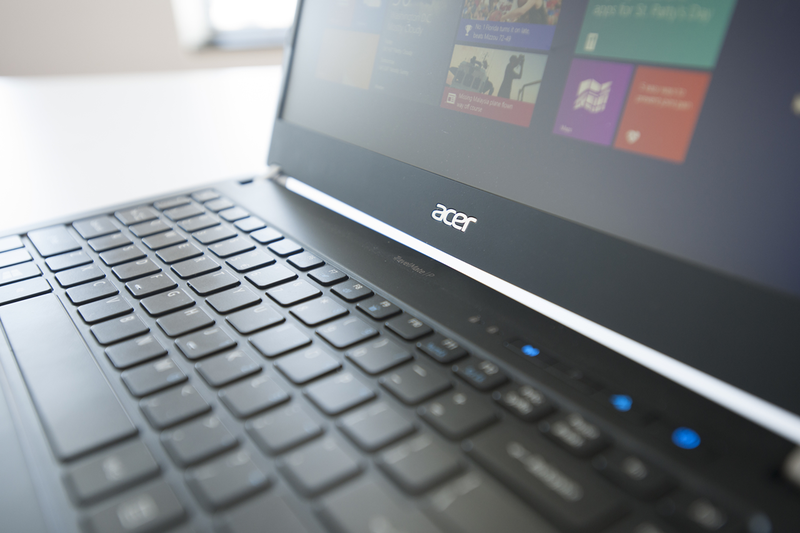 Acer offers a slightly different model—the $1099 TMP645-V-6446—that does have a vPro-enabled processor, but it doesn't have a discrete GPU. Acer promises Travelmate Pro models will remain essentially the same for 12 to 18 months from introduction, and that replacement parts will be available for at least three years. 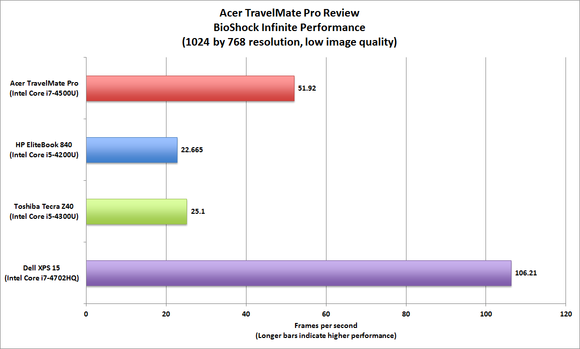 The TravelMate Pro’s battery life won’t blow your mind, but it’s very good considering it’s powering a discrete GPU. The unit comes with a two-year mail-in/carry-in warranty, which can be extended one additional year. On-site and other service options are also available at extra cost. This information is a bit difficult to find, as Acer hides it from anyone whose laptop is not registered. At $1300, this Travelmate Pro is quite a nice piece of hardware, and it’s significantly less expensive than much of its business-oriented competition. But the lack of a 5-year warranty, its shortish lifespan, and niggling details like different-gauge screws will irk the corporate element of its intended audience. The favorable price-to-performance ratio make it a go for independent business users, but for corporate fleets? Probably not. For individual business users, this laptop offers a nice blend of modern features and solid performance. It's not stylish, but its input ergonomics are very good.